In modern day urban landscape that is busy with people and full of traffic, taking the public transport or even driving to work has gradually become more and more cumbrous. This therefore calls for a new approach, one that will save on transport cost, reduce environmental pollution and solve the traffic problem. Wait, don’t we already have one in electric scooters? Well, yes. Electric scooters are not only environmentally friendly, they are also relatively cheap when compared to electric vehicles. Additionally, they are rechargeable, compact and in some parts of the world they don’t require licensing nor insurance. They are also available in numerous different beautiful designs ranging from a simple electric scooter to modern, stylish and portable scooters. Its popularity has grown tremendously over the last couple of years. 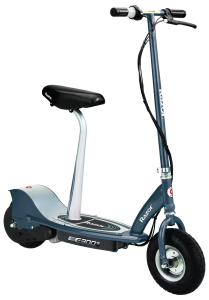 There are numerous different brands and models of electric scooters available on the market today which makes it a little difficult to select one that meets your needs best. Apart from affordability, there are various other things to look out for when selecting an electric scooter for your kids. These include design, durability and frame construction, battery pack, motor, wheels and suspension, speed, breaks, computer and accessories among others. In this article we are going to discuss the top five budget friendly electric scooters by looking at their main features, price, advantages and disadvantages and finally, we will give you reasons why they are considered the best. Let’s start off with a comparison table. We have highlighted the bestseller in green and the best choice in our opinion in red. 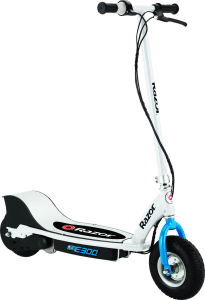 Razor E300 is a decent mid-range electric scooter that is ideal for both teenagers and kids. It has a fairly high speed compared to its counterpart E100. It can reach up to 15 mph while offering the same 40 minutes of ride time on one charge as E100. It also has a super-sized frame and deck which provides the rider with the option of standing firmly on the scooter with both feet. Its twist throttle allows smooth control over speed while its retractable kickstand makes it possible to leave it in an upright position when not in use. Additionally, the broader 10″ tires offer a serene and comfortable ride and provide for a maximum weight limit of approximately 220lbs. The things that make this electric scooter stand out are its solidity and durability. It can also go through potholes and rough terrain thanks to its 10 inch pneumatic tires. Megawheels is popularly known for its incredible hoover boards. However, they have recently ventured into the electric scooter business and they are the manufacturers of Megawheels S1 electric scooter. This machine does not offer much in terms of perks but its lightweight nature makes it a great choice for teenagers and kids. It has a maximum speed of 14 mph with an overall distance of 5 to 8 miles per charge. It features a press-type accelerator throttle and brake throttle on both handle sides meaning there is no “go or stop’ button. Its robust aluminum frame can handle a maximum weight of around 150lbs. Additionally, it also has a great folding mechanism. It is best suited for short distances though it can get a bit bumpy particularly in rough terrains. This is one of the most fairly priced electric scooters that is fast and light. It is the perfect choice for someone on a budget. GOTRAX Glider is a reasonably priced machine that is well-balanced and offers a great experience. This machine looks like the regular scooter but in a self-contained unit. It has a maximum speed of 17 mph. It also has 2 different speed modes which can be adjusted according to your preferences. Mode 1 enables you to go at up to 9 mph whereas mode 2 offers you top speed of 18 mph. It has a lithium ion battery that offers a maximum distance of 9 miles per charge. It can withstand a maximum weight of 264lbs making it ideal for both kids and adults. Moreover, it has a backlit screen display that will enable you to track your battery levels and speed. It also has a great LED headlight which makes it possible for you to take a ride at night. efficient and smooth breaking and has relatively good speed. This is a perfect gift for your 8 to 14 year old kid. Razor E300S is among the cheapest electric scooters and has been perfectly designed to offer comfort and style. It features a frame and super-sized deck for riders of all ages and sizes. Its high performance chain driven motor enables it to move at a maximum speed of 15 mph. The machine also has a pair of broad, 10 inch pneumatic tires that ensure a smooth ride. Other features include a hand operated rear brake and a twist grip throttle for smoother stopping power and easy operation. With a fully charged battery you will be able to cruise around for a maximum of 40 minutes covering a distance of approximately 12 miles. With a charging time of roughly 4 to 5 hours, Razor E300s seated electrical scooter is among the quickest charging and budget friendly scooters. Moreover, it also has a spring loaded retractable kickstand. This is scooter is ideal for both older teens and adults who need a simple, reliable, energy efficient and fast mode of transport. The padded seat and the seat post can both be removed if you like to ride in a standing position. 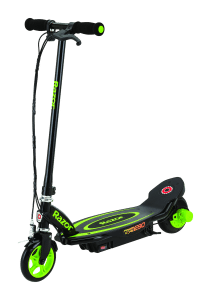 This is one of the most lightweight and affordable electric scooters for teens and kids, with a power equivalent to that of Razor E100. It is in fact the cheapest in this list. Its lightweight nature doesn’t necessarily mean that it is frail, in fact it’s quite the opposite thanks to its heavy duty all-steel fork and frame. It also features a kick start chain motor that generates a maximum speed of 15 mph – enough for small kids to cruise around the neighborhood. It is an improvement of its previous version i.e. Razor Power E90. Its 12V battery offers 80 minutes of non-stop use though this is dependent on the weight and terrain. With this power, the machine can cover a distance of approximately 12 miles. Other features include rear foot brakes, a push button throttle, urethane rear and front wheels and a soft rubber grip. Lightweight. It is ideal for those people looking for portable scooters. Affordable. 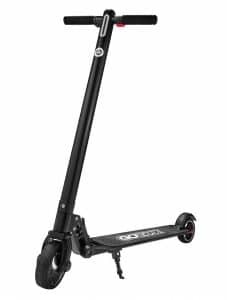 As stated earlier this is one of the cheapest and reasonably priced scooters. Sufficient ride time (80 minutes). Torque. Unfortunately, this machine doesn’t come with enough torque power. This therefore makes it difficult for this machine to zip through a steep or hilly terrain. Limited height. The handle-bar is way shorter compared to some of the top-end models meaning will need make sure that your kids don’t outgrow it too soon. This is a great and affordable machine that is perfect for first timers. It offers entry level options for beginners. It also offers an incredible ride time of up to 80 minutes which is impressive in itself. It features the latest power core technology that makes the ride smooth and comfortable. As a result of advancement in both motor and computer technology along with the creativity of automotive design experts, these modern electric scooters offer a practical and fun way of cruising through the crowded terrain of towns and urban areas. In addition, these scooters offer a new solution to the age-old problem of environmental pollution. As an extra, it also offers you an opportunity to enjoy nature while riding. It also helps you to save on transportation and maintenance cost. While the modern self-balancing scooter provides a fun form of entertainment, the electric scooters offer you an enjoyable and legitimate alternative form of transportation. You can also use them in bike lanes, sidewalks and roads. 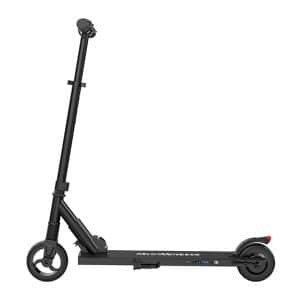 All the above mentioned scooters are fairly priced and each have their advantages and disadvantages but one thing you can be sure of is that they are quite effective in their own right. If you are looking for fast and comfortable scooter then you should go for Razor E300, GOTRAX Glinder or Razor 300S Seated Electric Scooter. If you need comfort, durability and style then you might want to consider Razor Power E90 or Megawheels S1 Electric scooter. Lastly, affordable scooters of quality are an investment that pays back quickly. For teens and kids they provide healthier and better investment compared to mobile gadgets and video games that they are used to. As for adults, it helps to save tons of money on gas and maintenance compared to other means of transportation. If you have ever thought riding a scooter was great and a fun experience, wait until you get to try one of the electric scooters from this review, you will love it!